We bring and share with you unexpected life-time memories….. I began my career as a porter. I completed my formal training to become an assistant guide and after several years of experience I continued my education to become licensed as a mountain guide for Mount Kilimanjaro. I am Certified as First Aid Instructor, Wilderness First Responder (WFR), and Cardio Pulmonary Resuscitation (CPR) certificate courses, regarded as the world standard in outdoor medical care for injuries and illness in remote and challenging environments. My progression from porter to licensed full-mountain guide provided with me the understanding of teamwork at all levels. Healthy meals on the table, warm tents at night and knowledgeable assistance all come about through a group effort from my entire staff. I established my own ideas for leading tourists on Mount Kilimanjaro from years of guiding for different companies. This background has enabled me to draw upon the strengths that I observed with different agencies. I have climbed all of the routes and have the experience to make my clients safe and secure along the way. Our team of head guides, assistant guides and porters are are all trained in first aid and along with our professional experienced cooks, they all work as a team to ensure personalized attention on your trip.We organize authentic trips to satisfy our clients and hopefully a promising future for our hard-working team that participates on our socially responsible expeditions. Our porters are employed at full-time basis, while some are hired temporarily at a fare wage payment. We are well-organized for outfitting climbing expeditions with great experience for our guests attempting the highest free- standing mountain in the world, the mighty Mount Kilimanjaro. All of our lead guides are Professional Mountain guides, and all of them are KINAPA Certified Guides (Kilimanjaro National Park). This is an important aspect of guiding to ensure that your guides have the high standards required by the Kilimanjaro National Park. You should expect high standards from the guides that you trust your life and safety with, for an entire mountaineering expedition. While some guide services conduct their own in-house training, few guides have any formal, consistent and comprehensive training. Although risk can never be eliminated, proper training can help minimize it. Climbing skills alone are not enough. Guiding experience and training, as well as evaluation of guiding-specific skills, are essential to maximize competency and greatly reduce potential hazards. Most people expect formal training of a doctor or lawyer. Shouldn’t you ask the same from your guide? Most of our lead guides are not only certified by the KINAPA,but occasionally we have very qualified local assistant mountain guides proven to be of a superb asset to expeditions. We strongly believe that having experienced professional mountain guides is extremely important for several reasons; to attract clientele from many parts of the world, due to the competitive nature, require mountain guides to adhere to increasingly higher and higher standards of mountain guiding, professionalism, and safety in the mountains. Our guides have extensive guiding experience. To ensure higher standards of safety and professional high altitude mountain guiding expertise, and to provide you with a quality mountaineering experience, we carefully choose our guides according to these standards. Interestingly enough, Kilimanjaro Nature’s Guide Baraka Dalali was born in Southern Tanzania, where the altitude is 2800 meters in the famous Udzungwa Mountains. Baraka has lived and worked in Arusha for seven years.He is a professional mountain guide, with a wide range of high altitude mountaineer guiding experience. He is fully certified by WFR – Wilderness First Respond with American and European standards and brings a unique and unparalleled combination of knowledge and experience to Kilimanjaro expeditions. Baraka knows the mountain better than perhaps anyone. He is well known and well respected on the mountain. He has been on almost every face, side, and valley of Kilimanjaro.The importance of having previous local experience has been proven over and over again. We bring international guiding experience and standards when dealing with quality logistics, pre-logistics, weather, and many other aspects of the Kilimanjaro climb. After seven years of experiencing expeditions from a porter to a licensed guide on Kilimanjaro, Baraka has developed an incredible relationship with the local people, mountaineers, Park Authorities and Park Rangers. This aspect makes the Kilimanjaro Nature team unique. Our success speaks for itself, as today we are among the most successful outfitters for Kilimanjaro expeditions. Having a high guide-to-client ratio is essential to the success of a trip, especially on summit day, when so many variables arise and the number of guides plays a critical part in the success of an expedition. If for any reason a member needs to descend, or a slower pace is required for part of the team, having multiple guides is a most powerful tool. Decisions on group management are constantly changing, especially on summit day, depending on such situations as weather,group strength,and rhythm.I have literally seen climbing groups as large as 10 people without a ratio of 1 to 2 guides! This is something that we are unable to understand…the margin for error is too high in such a situation. Safety is extremely compromised and the chance of reaching the summit is much lower. Kilimanjaro Nature has always been ahead on equipment standards. We believe it is necessary to use the best equipment available in the industry to succeed on the mountain. Not only do we use the best equipment, but we renew our equipment at the end of each season to keep our equipment in excellent condition.We mentioned the importance of high quality equipment, but we do not believe in bringing up a mountain everything available since that would be heavy and inefficient. We believe in selecting the best possible gear for the task, still keeping it to a minimum.Our menus are some of the best expedition menus available in the guiding industry. They have been developed meticulously and thoughtfully, evaluating amount of calories per day carbohydrates, weight, taste, variety and creativity. We tremendously emphasize staying hydrated. One of the most important aspects of our menu is the way we pack our food. Although not related to the taste of the food, it is logistically one of our keys of success. 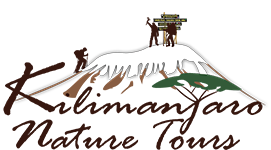 Kilimanjaro Nature completes its trips safely and successfully with our excellence team of porters. We have a core group of porters we use for many of our climbs. On all of our climbs we work to a ratio of four porters for every climber. This means none of the porters are overloaded with too much gear. It also means that you don’t need to carry anything but the day’s essentials from camp to camp each day, making the climb much more enjoyable. Kilimanjaro Nature’s reputation on the mountain means that numerous porters want to climb for us and our core groups are all excellent, friendly and hard-working individuals. Climbing Mount Kilimanjaro…no standard is required.